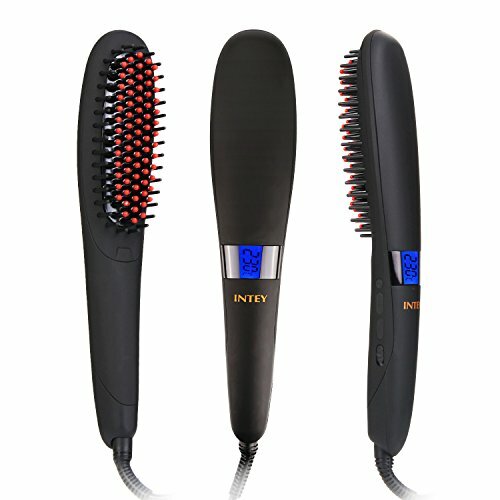 INTEY Electric Straightening Hair Brush with Auto Shut Off, Anion Hair Care and Temperature Lock Function - Black - Luxury Beauty Care Products ! ON/ OFF: long press 3s. "+" button: short press plus 5°C/41℉ every time , long press will plus temperature fast. "-" button: short press minus 5°C/41℉ every time , long press will minus temperature fast. Lock button: when you press it, the temperature can be locked, LCD will show "LOC". 2. Place straight brush close to the roots of selected hair. 4. Repeat steps 1 to 3 times. 12 months warranty - Manufacturer warranty for 12 months from the date of purchase. Change the temperature units: press the "+" and "-" button at the same time for changing the unitQuick heat up and easy to use: the INTEY hair straightening brush heats up to 180°C/356℉ in mere seconds, straighten your hair in minutes , saving you time and effort . Each stroke will leave your hair smooth and straight .